People talk easily about “bucket lists.” They talk about 10 places they have got to see, or ten adventures or escapades they hope to experience. They count the places they have been to, and they count the places they plan to go to. I have to admit though, although there are many places I would like to visit, I have no regrets about not getting to some of them yet – only because I have been busy visiting somewhere else. I am sceptical when I see people listing spiritual places to visit, as if spirituality is some kind of commodity that can bought, that is a matter of choice, and that we can pick and mix our experiences. I cannot remember where I picked up this book. I must have bought it at a bookstall at a fete, or in a second-hand bookshop. But I was rummaging through some other books in search of a book I bought in Crete last year when I came across Sacred Travels: 275 Places to Find Joy, Seek Solace, and Learn to Live More Fully by Meera Lester (Avon MA: Adams Media, 2011). The very first place she visits is the Shrine of Rumi in Konya in south central Turkey, which I visited last year. It was an intriguing opening invitation, and so I decided to read on. I imagine I am well-travelled, but I was surprised, as I made my own mental list as I read through this book, that I had visited at least one-fifth of the places she recommends. There is a heavy emphasis on places in Jerusalem, Rome, India and Japan, and as the average reader might expect she includes Lourdes and Fatima, although I have never been to either. I was surprised by own omission. I have yet to visit many places on these islands that she describes, including the cathedrals in Durham, Lincoln, Norwich and Winchester, nor have I been to Stonehenge and Glastonbury. On the other hand, there are some inexplicable omissions, including the Lavra Monastery outside Moscow, and other important centres of Russian spirituality in Moscow and St Petersburg. As a woman she could not visit Mount Athos, it is still worth listing, even if a writer has to rely on someone else’s descriptions. There are no great Orthodox centres in Romania or Bulgaria either. I was surprised at other missing spiritual centres too: there is no entry for Westminster Abbey or Saint Paul’s Cathedral in London, or King’s College Chapel, Cambridge, there is no Quaker meeting house, there is no mention of Wesley’s chapels, and there is no Note Dame in Paris. The Taj Mahal is a surprising entry, as it is a mausoleum and not a temple. To include it but not Yad Vashem.in Jerusalem is an idiosyncrasy to say the least. Although Mecca is mentioned on the cover, it is not included inside. There is a Baha’i temple in the US, but not the main Baha’i centre in Haifa. The Blue Mosque in Istanbul is here, but not Aghia Sophia. Qom, which is the centre of Shia devotions, is nor mentioned. The Mormon Tabernacle in Salt Lake City has a page of its own, yet it is not open to non-Mormon visitors. And the garden in Galway she recommends and the Hill of Ward in Co Meath are curious choices when Christ Church Cathedral and Saint Patrick’s Cathedral in Dublin are overlooked. I was delighted that Lichfield Cathedral has its own page, but I wondered about the accuracy of each entry when I found Lichfield spelled Litchfield, and I read the travelling recommendations: “Travel from Birmingham (17 miles north) or London (124 miles south) to Lichfield by bus, taxi, rental car, or coach tours.” Of course, Birmingham is south, no north of Lichfield, and a taxi from London to Lichfield might ensure that this is the only 1 of the 275 places you would visit. She spells Navan in Co Meath as Naven, insists that Croagh Patrick in Co Mayo is Mount Croagh Patrick, and places Temple of Hera in Olympia in Athens instead of the western Peloponnese. She offers special prayers, meditations, and devotions for each sacred site, but often these are not connected with the denomination or tradition associated with a chosen location. This may be a book for the new-age spiritual tourist whose tastes change with the weather, and it’s also a little fun, even if it can send you in the wrog direction or expensive taxi journeys. But I’m glad I bought it at a bookstall and did not buy the original when it was published. I try to visit a monastery at least once a year, and I am looking forward to visiting some monasteries and monastic sites in Greece over the next few weeks, as well as a one-day retreat in a monastery in England before summer ends. But which of her 275 places did I visit? 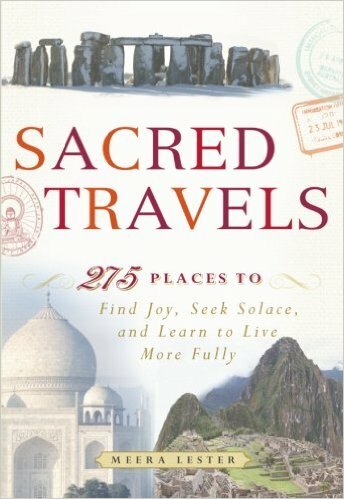 Meera Lester, Sacred Travels: 275 Places to Find Joy, Seek Solace, and Learn to Live More (Avon MA: Adams Media, 2011).